Over the past few years, the energy market has been abuzz with new and disruptive technology, renewable breakthroughs and other advancements that have changed how consumers engage with and purchase energy. However, redesigning large, complex organizations from the inside out is a difficult task. But the U.S. doesn’t have to look any further than the European market as a good example of embracing innovation to meet customer trends and disruption. While we can learn a lot from the European utility market, comparing U.S. and European utility scenes isn’t necessarily easy. There are key differences in market design that make this comparison tricky, most of which center around consumer choice. Simply put, I’ve noticed that choosing an energy provider in Europe is similar to choosing a cell phone carrier in the U.S.; the EU allows European residents to switch providers, and the European Parliament may soon approve rules allowing European residents to switch to another provider within 24 hours. Since this means facing the risk of losing customers daily, European utilities must place more emphasis on customer retention through engagement. This model encourages a culture of customer engagement and consumer choice. While the U.S. utility infrastructure might not shift dramatically any time soon, especially in ways that exactly mimic European ones, we are still seeing drastic shifts on which utilities can capitalize. Adapting to these new forms of technology and models by using tactics similar to what we’ve seen in Europe could be pivotal to a utility’s survivability, customer retention, and — in some cases — better definition of long-term renewable energy goals. Here are a few items I think we can take from the European utility mindset based on my experience in the energy space. I believe European utilities have mastered the art of ensuring multiple touch points for communication to ensure their customers feel as if they’re a valued part in the utility decision-making process. What we often refer to in the U.S. as ratepayers are considered customers in Europe. Customers around the world are beginning to form their expectations on experiences found in more digitally mature industries. As a result of this, IDC suggested in a 2017 report that companies who once barely knew their customers are learning to be more demand-oriented. This is demonstrated by the report’s findings on the prevalence of focus groups as a method of idea generation for utilities. According to the report, 75% of utilities surveyed in the U.K. are using focus groups, as are 80% in the Netherlands, 45% in Germany and 50% in France. Another form of consumer engagement comes in the form of hackathons. During these hackathons, teams of programmers, developers and designers can compete to create a software solution for utilities or a utility initiative. According to IDC, 34% of European utilities surveyed used hackathons to drive new business ideas and solutions. These types of customer engagement initiatives not only allow utilities to use talent to stay on the cutting edge of technological trends but also allow customers to benefit from new innovations and even play a vital role in creating the innovation itself. Enel, along with global energy companies like Engie, Centrica and EDF have reportedly gone on a buying spree in the past year. Companies like these have acquired solar, energy efficiency, electric vehicle charging and clean energy technology companies to maintain their relevance in the fast-paced European market. However, it’s not uncommon for U.S. utilities to be overly cautious with the adoption of new — not to mention disruptive — technologies. Another recent example of the “adopting rather than shunning” mindset in the U.S. can be seen in cryptocurrency mining. 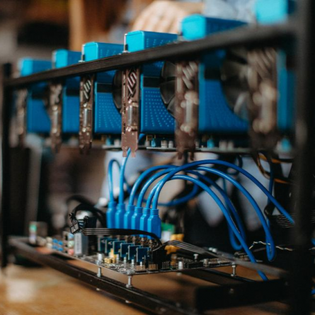 Cryptocurrency mining is a process in which computers are used to solve various puzzles to confirm blockchain transactions. Massena Municipal Utility in New York recently began to negotiate cryptocurrency mining contracts on a case-by-case basis. While it’s still new ground, this is a good example of working alongside a (very) disruptive technology rather than shunning it completely. By adopting new technologies, utilities can connect with customers and stay on the cutting edge of innovation. This could open up the possibility for new business opportunities, but if done properly, it could also open up the opportunity for more customer touch points and showcase progression and understanding to customers. With high customer turnover, it appears that European utilities have learned that customers who are well educated about their energy bill are more satisfied. Developing technologies for accurate and easy billing can also help resolve misunderstandings. The energy efficiency software provider Bidgely, which itemizes appliance usage for customer bills, has thrived in the European market. They white-label their technology to energy providers across the globe so that customers have the experience that these energy companies care more about their ability to save money and be more energy efficient. This not only helps customers feel like they are in control of their energy consumption patterns but could also reduce the risk that they might switch energy providers for fear of losing access to software solutions they have come to like and rely on. If a customer doesn’t have the ability to go solar or do something in-depth, utilities can also offer a variety of options for customers to take control of their efficiency, like accessible rebate programs or even local initiatives. They can also simply give customers more touch points through blogs, newsletters and informational video posts. These touch points can also turn into periodic feedback opportunities for customers to share their thoughts. Small showcases of transparency and control for the customer can help utilities become more customer-focused, which can result in higher engagement, customer satisfaction and loyalty. While completely redefining a business model is a complex task, adopting a new mindset doesn’t have to be all that daunting. I believe these mindsets are low-hanging fruit for U.S. utilities, whether or not they are in a regulated market. Pick one and focus on it for one year and measure the results, then take baby steps by upgrading enterprise productivity across the organization. Through enhanced customer engagement initiatives, utilities are more likely to put the customer first in terms of choice and participation, thereby transforming the utility-customer relationship into a partnership.